[PDF] Electric Power Substations Engineering (3rd Edition) | Free eBooks Download - EBOOKEE! Description: The use of electric power substations in generation, transmission, and distribution remains one of the most challenging and exciting areas of electric power engineering. Recent technological developments have had a tremendous impact on all aspects of substation design and operation. With 80% of its chapters completely revised and two brand-new chapters on energy storage and Smart Grids, Electric Power Substations Engineering, Third Edition provides an extensive updated overview of substations, serving as a reference and guide for both industry and academia. Contributors have written each chapter with detailed design information for electric power engineering professionals and other engineering professionals (e.g., mechanical, civil) who want an overview or specific information on this challenging and important area. [b]This book:[/b] [list][*]Emphasizes the practical application of the technology [*]Includes extensive use of graphics and photographs to visually convey the bookâ€™s concepts [*]Provides applicable IEEE industry standards in each chapter [*]Is written by industry experts who have an average of 25 to 30 years of industry experience [*]Presents a new chapter addressing the key role of the substation in Smart Grids [/list]Editor John McDonald and this very impressive group of contributors cover all aspects of substations, from the initial concept through design, automation, and operation. The bookâ€™s chaptersâ€”which delve into physical and cyber-security, commissioning, and energy storageâ€”are written as tutorials and provide references for further reading and study. As with the other volumes in the Electric Power Engineering Handbook series, this book supplies a high level of detail and, more importantly, a tutorial style of writing and use of photographs and graphics to help the reader understand the material. Several chapter authors are members of the IEEE Power & Energy Society (PES) Substations Committee and are the actual experts who are developing the standards that govern all aspects of substations. As a result, this book contains the most recent technological developments in industry practice and standards. 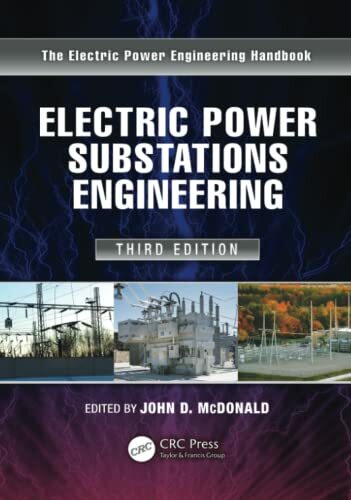 No comments for "[PDF] Electric Power Substations Engineering (3rd Edition)".